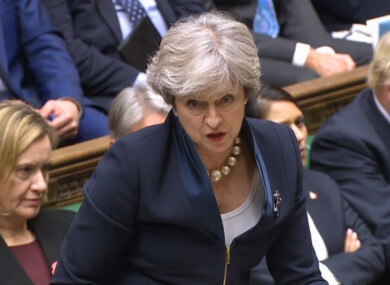 BRITAIN’S GOVERNMENT HAS survived the first parliamentary challenges to its Brexit bill, as MPs began voting on various amendments tabled on the landmark legislation. It won the vote – the first of many expected in the coming days and weeks as lawmakers debate some of the hundreds of amendments put forward – by a comfortable majority. MPs also voted to keep the opening clause of the law, repealing the 1972 European Communities Act that took Britain into the bloc. They fired the opening salvos in what is expected to be a fraught parliamentary battle, with a heated debate on the date Britain leaves the EU — and whether to use London or Brussels time. MPs debated one of the government’s own motions — to enshrine in law the moment Britain leaves the EU as March 29, 2019 at 11pm in London and midnight in Brussels — but were not voting on the matter today. In a bizarre twist, opposition Labour MP Frank Field proposed his own rival amendment to set the departure point one hour later at the start of March 30, 2019, but later withdrew it amid a lack of support. The bill — also known as the Repeal Bill — is intended to ensure legal certainty and avoid a damaging “cliff-edge” when Britain leaves the bloc. MPs also debated a Labour amendment — one of almost 200 pages tabled — to extend the jurisdiction of the European Court of Justice into a post-Brexit transition period. A vote on that amendment was expected late today. The government said it wants an implementation period of around two years after Brexit — but insists Britain will be fully out of the EU by then. Two ministers have quit in the past fortnight — one over sleaze allegations, the other accused of effectively running her own foreign policy. The Withdrawal Bill as it stands would not be acceptable and we would not be able to recommend approval of that. Email “Britain's government has survived the first parliamentary challenges to its Brexit bill ”. Feedback on “Britain's government has survived the first parliamentary challenges to its Brexit bill ”.